If you ever manage to visit the Austrian capital of Vienna, you are likely to have a lot to look at, apart from whatever aesthetically pleasing meets your eye. You may well be left to rub your eyes in disbelief after having a peek at the majestic Schloss Belvedere, or may be forced into gaping open-mouthed at the Hofburg Palace’s view when darkness falls across the once imperial city, but Vienna has a lot more to offer than just that. Once you manage to step into the chaotic world of football in the city, if there’s anything that greets you gleefully, it’s pandemonium. The hap-hazard approach that the game oozes isn’t something that comes close to suggest that it’s Vienna itself where the game acquired the intellectual outlook and this in turn, led to the development of one of the fiercest rivalries in world football. And the history stretches back to as early as the 1920s, when there was a need for concepts such as tactics and formations to be inculcated into the rather physical game. While, it was in England that the game had acquired the tag of being a sport meant for the robust and the males, it was the same country where the intellectuals had failed to take up football as something serious. The kick-and-rush approach to the game that the Englishmen had pioneered needed a refinement and it could only come about if the game could have been taken up by a section of individuals who knew how to deconstruct and perhaps, reconstruct. Football had become a sport for the working class in Britain around the 1920s, but in nations such as Austria, it was introduced by the upper middle class and the elite. The technical aspects of the game, which were never emphasized upon previously, intrigued the Austrian intellectuals. And unlike England, where the game was discussed in a rather laidback manner in pubs and bars, it was in coffee-houses that deliberations regarding how the game could be bettered took place. And this coffee-house culture shaped the very look of Austrian football, since football had become a sport of the urban areas across Europe cities such as Budapest, Prague, Zagreb and Vienna itself. Men and women of all ages clamoured in and around coffee houses as they began to assume the form of being salons during the fag end of the Habsburg Empire. Intellectuals, who discussed issues ranging from politics and literature to sports, dissected issues that most had never taken into account previously. As this culture expanded, every club in the country began to have its own coffee houses, where people hailing from diverse backgrounds and occupations gathered. In the 1920s, football had become so popular in Austria, that Neues Wiener Journal once said: “Where else can you see at least 40-50,000 spectators gathering Sunday after Sunday at all stadiums, rain or shine? Where else is a majority of the population so interested in the results of the games that in the evening you can hear almost every other person talking about the results of the league matches and the club’s prospects for the coming games?” And, while it was clear that the sprouting of football in the country was fascinating, the capital city was where it was really making waves. The division between the capital clubs- Austria Vienna and Rapid Vienna can be attributed to coffee houses themselves, as Rapid fans congregated at Cafe Holub and Vienna fans came together at Cafe Parsifal. It was some years later that the emergence of two of the greatest Austrian footballing icons saw both outfits go head to head to determine who had the upper hand in Vienna. Some argue that the rivalry between the players- Matthias Sindelar and Josef Uridil, created factions that were in opposition to each other, but the personalities of these players became a vital part of this rivalry as the foundations of the clubs differed. Uridil, who was a centre-forward by trade, exemplified the proletarian roots of his club- Rapid and hailed from working-class suburbs of Austria. His style of play, which oozed physical attributes of a battering-ram, also epitomized the working-class approach to life. Uridil became such a prominent figure in the country during that era that he began advertising products such as soaps, shampoos and fruit-juices, apart from having a song by famed cabaret artist Hermann Leopoldi sung after him. ‘Heute spielt der Uridil’ went the song and it was later that Uridil appeared in a German film called ‘Pflicht und Ehre’ (Duty and Honor) and even became a hit in the cinemas in 1924. Sindelar, much like Uridil became a celebrated figure during his prime. The forward appeared in wrist-watch advertisements , apart from also promoting some dairy products. He also appeared in a film of his own in 1938, playing the role of himself in a movie called ‘Roxy und das Wunderteam’. The emergence of these two players at their respective clubs coincided with the rise to prominence of Hugo Meisl’s Wunderteam, that is best known for its possession-based, passing minded football style, which was an attempt to replicate the great Rangers side of 1905. Meisl’s approach to the game saw him field and adopt 2-3-5 formation(inverted pyramid shape), sacrificing the third-back to use the centre-forward as a vital cog in the wheel. The usage of Uridil as a regular centre-forward in the inverted pyramid formation drew criticism from Austria Vienna fans, who felt Sindelaar was the right man to play up top. The Wunderteam had missed out on winning the inaugural Gero Cup in 1927, losing the first three games, but winning the last two against Italy and Hungary to finish second. And this forced Meisl into handing Sindelar the opportunity to prove his mettle on the international stage. It was an inch-perfect way of capturing how the Wunderteam had turned out to be. It was Sindelar’s impeccability, when it came to providing fluidity to attack, that acted as the most important part of this side, that earned the nickname of ‘The Danubian Whirl’. This is what shaped the rivalry of two of the greatest and the oldest clubs in Austria, but the best of it was yet to come. The fans act as the defining feature of this rivalry, but the fixtures act as the all-important backbone. The playing style that both Uridil and Sindelar exhibited is still widely known to be the traditional styles that both Austria Vienna and Rapid Vienna have managed to carry forward from that time. Uridil’s battering-ram, physical style elucidates Rapid’s approach to the game, while Sindelar’s technical and possession based style is still fancied by those from the Austria Vienna side of the rivalry. 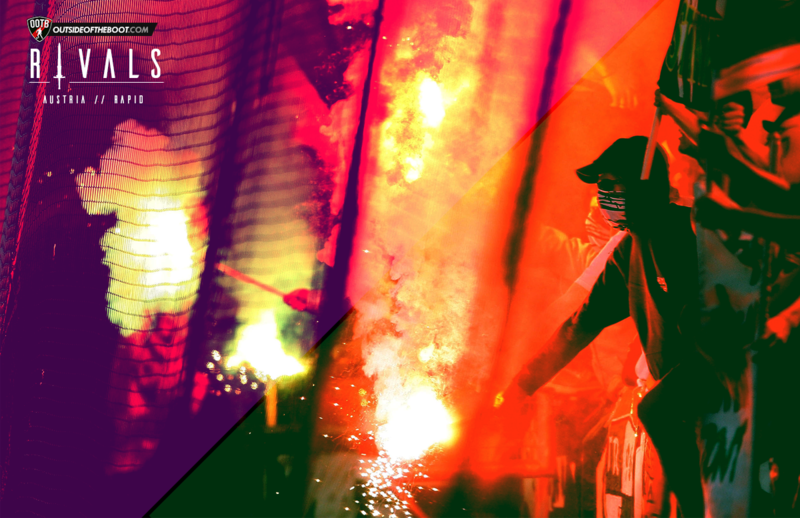 The emergence of Red Bull Salzburg may have played an important role in making sure that the sides aren’t meant for the top of the league anymore, but the rivalry hasn’t lost its spark in any way. The Wiener derby is still the most played city rivalry game, after the Old Firm and Edinburgh Derby. October 2014: Before this outing, the Rapid period of dominance had seen Austria succumb to a ten game winless streak against their old foes. The last time Austria had won was in March, 2011, but this game ended up sparking a three-game unbeaten run against Rapid. It took a last-ditch winner for Austria to win the game, as the tie ended in an entertaining 3-2 triumph. August 2015: High-scoring games in this derby ignite envy in the hearts and minds of the losing fans, but the fierceness that involves the sides always makes the games entertaining. And this fixture in the beginning of the 2015-16 season was another of those rare high-scoring games. Rapid won the game 5-2 and the three points acted ever important in helping Rapid finish over Austria when the campaign ended. Apart from Sindelar and Uridil, there have been multiple characters that have embraced the rivalry, to enrich it with their abilities and presence. Franz Binder: The Austrian was another one of those pioneering, prolific Austrian goalscorers, who never ceased scoring for Rapid. In a total of 242 appearances for his club, he scored over 260 times, scoring as many as 21 times in the Wiener Derby during his stay at Vienna from 1930 to 1949. Bimbo won the Austrian league title as many as four times at Rapid and won the highest scorer title thrice. He played for the club throughout his nineteen year long career, retiring in 1949 itself. He scored over 1000 goals in his career and had a goal-per-game ratio of 1.33 and is placed alongside the likes of Gerd Muller, Josef Bican and Pele, when it comes to prolific goal-getting. Peter Schottel: Peter Schottel has gone down in history as being one of the most adored Rapid Vienna players ever. He plied his trade with the club for around 14 years- from 1988 to 2002 and it is the only club he ever played for during his career. A defender by trade, Schottel won the Austrian league title thrice with Rapid, claiming the cup twice. He has made the most number of appearances ever in the Wiener derby- 48 and it’s no surprise considering how much of a hard nut to crack Schottel was. Apart from playing for Rapid, Schottel managed the club as recently as 2011, staying there till 2013. 19, Football Writer, BackPageFootball, EPLIndex, ForzaItalianFootball, VAVEL. Manchester United fan. Aspiring football journalist.